SWSS Evaluation Dashboard (2017 results) Please note: The Dashboard does not yet include 2018 information. To account for the new 2018 College and Career Ready Performance Index (CCRPI) formula under the federal Every Student Succeeds Act (ESSA), GOSA recalculated the Strategic Waivers School Systems (SWSS) targets using the 2017-2018 CCRPI as the new baseline year. Given the recalculated targets using 2017-2018 as the baseline, Year 2 (2017-2018) becomes a baseline reset year that does not count for or against a school. 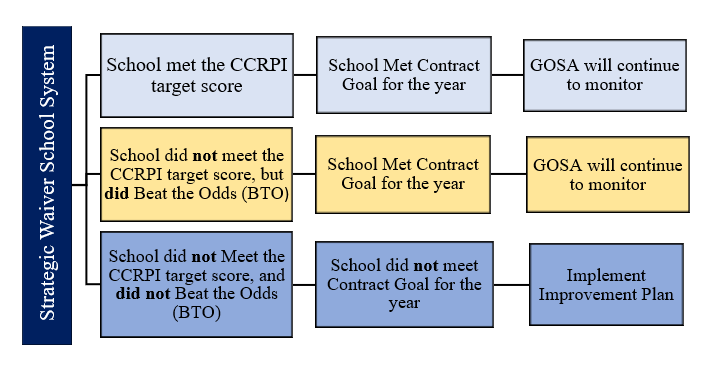 As a result, a school will be deemed as meeting the terms of its contract at the end of the contract term if it meets its targets or “Beats the Odds” in two of the four other years (Years 1, 3, 4, or 5), or it shows three years of growth by meeting the revised Year 5 target, which will represent three years of growth from the Year 2 baseline, or “Beating the Odds” in the fifth year. Strategic Waivers School Systems (SWSS), formerly referred to as Investing in Educational Excellence (IE2), performance contracts provide local school districts with greater governance flexibility as a means to increase student achievement. Local Boards of Education (LBOE) can enter into multi-year contracts with the State Board of Education (SBOE) based on strategic plans developed in partnership with Georgia Department of Education (GaDOE) and Governor's Office of Student Achievement (GOSA). Such plans must identify specific school-level student achievement goals that are in addition to current federal accountability requirements. The site below provides more information on the flexibility and accountability for all Strategic Waivers School Systems. GOSA and GaDOE work closely with districts to ensure that the school-level student achievement goals are sufficiently rigorous to warrant granting the flexibility requested by the local school district. Progress toward meeting those goals is monitored by GOSA on an annual basis and reported to the State Board of Education (SBOE). If, at the end of the contract, any school has not met its performance goals for at least three years of the contract and is not meeting targets at the end of the contract, GOSA will recommend consequences to the SBOE. In collaboration with the GaDOE, GOSA has revised its SWSS Evaluation Policy to provide more clarity to districts making flexibility decisions. The document outlines target setting and timelines for evaluation results. For more information on the flexibility and accountability portion of SWSS contract, the GaDOE’s September 2014 Presentation at the Georgia Education Leadership Institute provides more information.